I live in Metro Atlanta, an area which had an interesting few days this week. Note, I'm using the word "interesting" as in the Chinese proverb, "May you live in interesting times" or the Firefly definition, "oh, god, oh, god, we're all gonna die". Not that I think a little snow and ice will kill you, but I'm fairly certain that someone thought it might by Tuesday night. 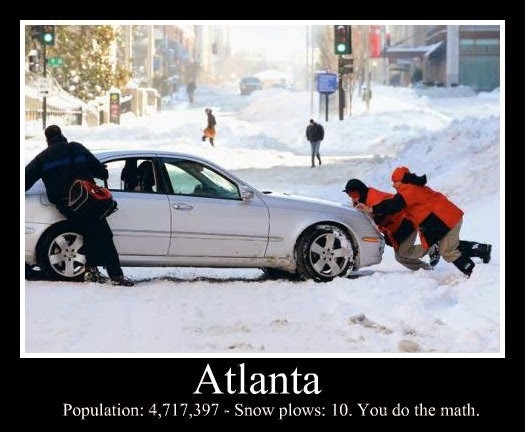 If you haven't heard, the Metro Atlanta area got 1" - 3" of snow on Tuesday, as forecasted by, well, everyone. Now, snow is a bit unusual for here and if the storm had not been predicted two days earlier, what happened on Tuesday would be completely excusable. The problem here is that city and county officials everywhere around Metro Atlanta acted as though we weren't going to be hit with snow. So no schools closed, no government offices closed, no one asked people to work from home, they didn't have sand laid over bridges and overpasses... No prep work done anywhere - which caused a quite foreseeable disaster. Hundreds, if not thousands, of people didn't make it home Tuesday night. Hundreds of kids slept in schools in several counties. People abandoned their cars everywhere, opting to walk home. So, while it's easy to rag on Governor Deal and his statements that he didn't know about the snow, this week showed that people can still react with thoughtfulness and kindness, with no expectations for compensation or glory. Makes me proud to live here.